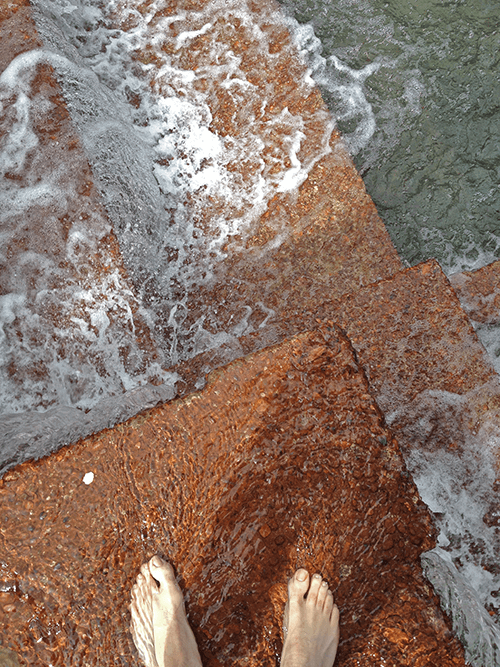 The author in Halprin's Keller Fountain. The interesting thing about what we in landscape do is that we design with living materials. In this way, as the Halprins recognized, we share important things with choreography and with theater. Unlike the performing arts, the life we design with lives slowly, moves minimally, and communicates only half-intentionally. Of course, to listen to the Halprins, the landscape designer is designing with people as well; the “with” here ostensibly meaning a process of “taking part.” Anna Halprin’s practice sets the tone here; if her name is the one to which credit has accrued, it has accrued in part in recognition of her surrender, or rather division, of authorship. Alison Hirsch See her article in Landscape Journal, “Facilitation and/or Manipulation?” has cast doubt on how this was carried into in Lawrence Halprin’s work; she suggests the ways in which consent from workshop participants was cultivated (or pretended), and routinely made to reflect the Halprin firm’s preferences. So much for the process of designing; what about what had always remained in question, anyway – the cultivation of particular behavior in visitors? Prescribed movement on sidewalks and street crossings, or slides and swings, is sufficiently general to be treated as a social compact, emanating from everywhere and nowhere. Anything beyond this, when examined in detail, seems a form of hypnotism, or worse, magic – capriciously molding behavior through molding space. Who wants to be made to dance? My interest in living museums stems from this problem. For a living museum, as it is presented, is dependent on programming people stationed at the site for interaction with both their surroundings and those who visit them. They are made to seem as though they spring from these surroundings; they are subordinated to the environment, rather than the reverse. In most similar situations – a front desk, a service counter – we assume a dual consciousness of the person in front of us, who is both a representative of a larger entity and irreducibly a person with a separate life. Denizens of the living museum share with actors Stephen Eddy Snow’s Performing the Pilgrims makes clear that many reenactors do not think of themselves as actors. a desire to diminish the perception of their own selves below this customary halfway point; but then, these reenactors are not contained within the magic volume beyond the proscenium arch. They are the willing servants of the environment. 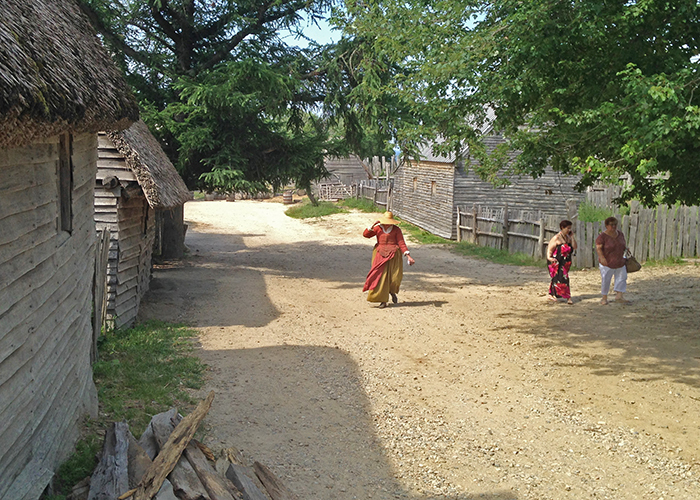 A reenactor in Plimoth Plantation. The anxiety around living museums and similar enterprises can likely be partially attributed to this – that the practice of acting has strayed out of its space, and will infect us as well. This may either simply represent one form of pervasive top-down creep from corporate bodies – the general molding of speech, action, gesture, and thought, the living museum being a particularly perverse endpoint – or, even worse, serve as its own direct contagion, as reenactment prompts a counterfeiting of authentic interaction, and as a more distant result conditions responses of acquiescence to unacceptable conditions. Do we design with people as our materials? I would suspect: not as much as we would like to and more than we would care to admit. The existence of a canon of programs to design with, where an appropriate form is associated to a repertoire of behavior, smooths this over; when we seek to prompt new desires and new actions, the unease starts again. If many people are shy around reenactors, or goad them into breaking character, it is in part because of this; they are sirens, beckoning us off the ship, and we need to tie ourselves to the mast.